---an assortment of CLAY, SOIL, SAND and FINE ROCKS to simulate different settlement levels. Suggestions for artifacts: A nice collection of "ancient" artifacts may take several years to assemble, but keep your eyes open for broken, dirty "treasures". You might visit your local pottery studio, a tile store (or better, an installer), the bead store (you can get scarab beads, clay beads, glass beads, etc. ), the craft store, a grandfather's shed for small rusty metal items. Save some chicken bones, fish bones (or ask the man at the fish counter). 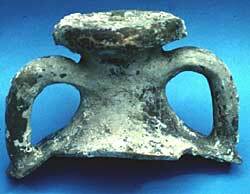 Sheep knucklebones were used for dice in ancient times-ask a butcher for some of those. There are lots of Greek and Roman reproduction vases and other artifacts available for sale on the web, but they are quite expensive. You may find such a thing chipped in a flea market or yard sale someday, someone's broken souvenir from a trip to Greece. Fragments of bricks and marble (especially marble which would have a fragment of an inscription-maybe from your local tombstone maker) would be great. Pot Sherds: For everyday Roman coarse ware use broken pieces of an old flower pot. To make Greek ostraka used in ostracism (see notes which follow), write in Greek script a person's name. If you want to add sherds of "finer" ware, use a marker to add Classical borders or part of a vase painting patterned after pictures of Greek and Roman pottery, then break the pot so that students have a chance to "reassemble". You might choose an artistic student to do the painting for you. Fill the box (or more than one box if you have a large class) with layers of soils, sand, pebbles, etc. and hide artifacts within the layers. If you have artifacts that can be "dated" remember to bury the oldest items in the lower levels! With advance preparation, you should preferably wet the soil and give it time to DRY after you have filled the box. This will make the dirt harden a bit and students will get a more realistic experience of digging into ground, rather than simply lifting powdery dirt. You could also have your top layer be a layer of clay. Hardening the dirt will also help artifacts stay in place when students are digging. Students must first measure out and construct a grid pattern over the top of the site (or a free standing one out of wire). The depth of the site should be measured and marked out too, perhaps on the side of the container. This can be done a day in advance. Assign students to jobs: some are diggers (assign particular quadrants to those), some sievers, some recorders and sketchers, some researchers of artifacts. If you have broken items that can be reassembled, some students can be the curators. Emphasize the importance of digging carefully and slowly. Excavated dirt should go into a bucket for sieving. Sievers will be looking for seeds, fish bones, etc. items too small for rough excavation but may give evidence about vegetation, diet, animal life of the settlement. Any artifact found must be measured, described in detail as to type of decoration, etc, sketched, and the recorded as to location (quadrant and depth). Students may want to photograph objects and position of site where found. Then they must be put into a tray for further study. Research of artifacts should involve students looking at pictures and hypothesizing about material the object is made of, whether it is part of a larger object, its use, whether it was functional or decorative or both. Coins should be researched and an attempt made to date them using online resources. Class discussions should center on putting the objects into the larger context of Roman civilization. If time, students could "publish" their finds to the world. Students should understand that similar to a scientific experiment, "data", objective descriptions of objects, get presented first, followed by the discussion of hypotheses about the objects and the "archaeologist's" conclusions. Here are some discussion ideas about objects suggested for your simulation. 1. COINS: these were sometimes buried in a pot for safekeeping, dropped by accident, tossed into a sacred well for good luck, scattered during a hostile invasion. Coins are highly useful resources in an excavation. They are records of political and military history and religious and cultural practices. They give evidence of technological accomplishment, trade patterns, prosperity, and economic policy. In addition, they are valuable dating tools. To drive this point home, a teacher might give each student a U.S. penny and ask students to brainstorm every element of our society that is represented by the coin. A MUST SEE! A learning module from Caerarea Maritima, Israel. Explains archaeological methods for treating coins found at a dig. Fully illustrated with photos of coins being conserved and researched. EXCELLENT pre-read for the teacher! "Dead Romans" A well-written summary of ancient coins written for school audiences. 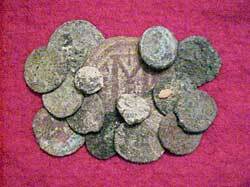 See many websites on ancient coins linked from the ACE website and included in URL bibliography on the ACE CD. A Byzantine coin ( see the one depicted here with the "M" on the reverse. ---observe some basic differences in the characteristics of Byzantine, Greek, and Roman coins. Students can notice, for example, that the side-facing busts of 4th century emperors were replaced with front-facing figures during Byzantine times. 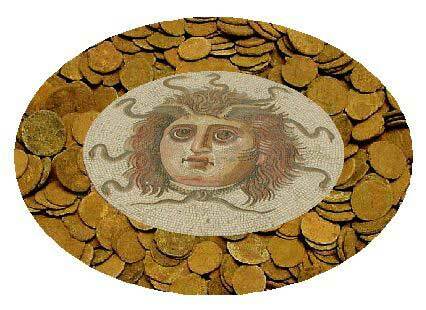 They may be able to notice Christian icons in the Byzantine coin as well and sometimes "cup" shapes. Greek coins are much thicker than Roman. The occasional coin may come from other cultures, such as Islamic. http://www.wildwinds.com/ is a site which has a multitude of images of Greek, Roman, and Byzantine coins. MANY others are linked at the ACE website and included on the URL list on your ACE CD. Warning :some of the brass tools are sharp, it is safer to use the rounded tool shown. ---let students handle a large bronze Roman coin, if you have one. ---let students see a greater range of minting quality and also how people altered coins over time. Some coins deteriorate because of environmental conditions (in the soil), some wear down from great use, others were simply minted poorly from the start. You may find coins that have chipped or broken, been cut down, have holes in them for wearing as jewelry, made of metals other than bronze. ---In connection with the fact that the coin contents of "your dig" are varied, you might wish to discuss with the students . 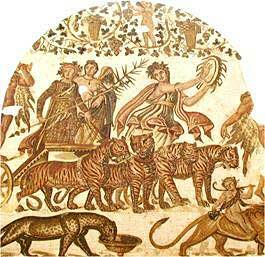 . .
3rd cent Roman Mosaic of Bacchus and a Quadriga of Tigers at Sousse in Tunisia. Marvelous mosaics from Tunisia depicting many aspects of Roman life-a must see! 3. POT SHERDS: ceramic pots were the most common form of storage vessels in the ancient world, serving both functional and decorative purposes. Olympic athletes were even awarded amphorae painted by the best skilled artisans of the day. Vases ranged from plain everyday coarse ware to ornate vases that were traded to the far reaches of the Mediterranean world. Because clay does not deteriorate in the soil, pot sherds are the most common ancient archaeological find. Top of Roman Amphora found by fisherman in S.E. England. Easton Maudit in central England are displayed. Ostracism: In Athens, pot sherds served as ancient ballots. Once a year citizens were allowed to choose one individual to exile from the city for ten years for wrongdoing, especially for showing signs of becoming too powerful. They wrote the person's name on ostraka (pot sherds) and cast them anonymously into a "ballot box". This process became known as "ostracism". A MUST SEE! A learning module from excavations in Caesarea Maritima, Israel highlighting archaeological methods relating to pottery-written for students and fully illustrated with images. Artifacts from a Roman Villa found on the site of a Primary (Elementary) school in England. Note the pieced together but incomplete pottery jug. For a brief discussion of the practice of ostracism. 4. FRAGMENT OF BRICK: Made of water and clay then dried in the sun or a kiln, bricks were commonly used in Greek and Roman construction, ESPECIALLY Roman. Excerpts from "Brickwork in Italy", a 1925 publication of the American Face Brick Association. AVERY thorough treatment of Roman brickwork-probably much more than you'll EVER want to know! 5. FRAGMENT OF MARBLE: quarried from many places in the Roman Empire and used in sculpture, monuments, tombs, etc. Marble also served as a more decorative facing for Roman brick structures. Augustus said that he "found Rome a city of bricks and left it a city of marble." This claim refers to his practice of facing brick buildings which were built previous to his reign with marble to give them a more impressive, stately appearance. It also made Roman buildings more reminiscent of Greek buildings of stone rather, and highly regarded in the Mediterranean world. 6. 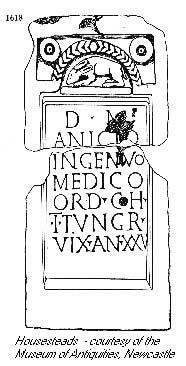 FRAGMENT OF MARBLE or STONE WITH INSCRIPTION: lead students in a discussion of public writing-dedicatory inscriptions on altars and other public buildings, tombstones, etc. Abbreviations and formulaic expressions were commonly used to save space and effort of carving into stone. 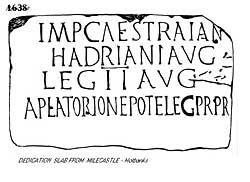 In the ACE Teacher Resources category, you will see a sub-folder "Background Historical Resources" - look there for genuine examples of Roman public inscriptions in stone, with their translations into English and also the fascinating curse tablets! of the First Tungrian Cohort. He lived 25 years” . 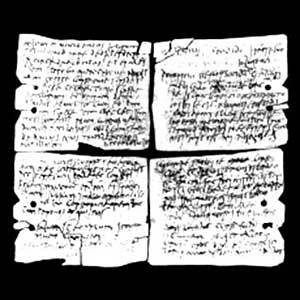 A site on medieval writing, but begins with Roman scripts used on stone and on ancient "paper". Fascinating with many examples of ancient manuscripts for students to view. 7. REMNANTS OF WRITING: students could discuss varying purposes of ancient writing-to keep records; communicate news to family, friends, and supervisors; preserve a literary creation; proclaim honors and dedications on public monuments, etc. and the types of writing materials Romans employed: wax tablets, papyrus, etc. EXCELLENT description of materials Romans wrote on and the content of practical, daily record keeping with illustrations from Vindoloanda. This discussion includes wax tablets and stylus, ink writing on bark, etc. A fascinating site about these amazing insights into Roman Life on the frontier. 8. SEALS: originally used in ancient Egypt for warding off evil spirits, but eventually became seals in the Mediterranean world which when pressed into wax authenticated documents and sealing goods. The scarab beetle was perhaps the best known from Egyptian culture. 9. KNUCKLEBONES (tali) and DICE (tesserae): Knuckle bones of sheep were used as dice because each side of a knucklebone had a distinctive shape of concave and convex curves. Knucklebones were also known as tali. They were made from the knucklebones of sheep and goats or in replicas in ivory, bronze, and goats. They were used by men for gambling. Children also used them for games like jackstones, where someone threw five in the air and tried to catch all of them on the back of hand. In gambling, four tali were used at once. They were thrown from hand or dicebox. No marking was required since all sides were different, but sometimes a talus was numbered 1,3,4, and 6. Thirty-five different throws were counted. The lowest throw, four aces, was Vulture. The highest throw, four different tali, was Venus. It was the Venus throw which designated the master of the revels. A MUST SEE! WONDERFUL site for Roman board games-includes rules for how to play a knucklebone game. Also contains images of beautifully decorated ancient Greek knucklebones. FRAGMENTS OF CLAY OIL LAMPS: Aside from natural lighting, oil lamps were the most common source of light within Roman buildings. Clay lamps could be carried individually or several of them could hang from a lampstand (called a candelabrum in Latin) for greater brightness. Lamps were often decorated with images of gods, patterns, elements of Greek or Roman life. Roman Jokes!!! Go here for lots of "How many ____ does it take to light an oil lamp?" riddles. SEEDS, FISH BONES, ETC. : Discuss how these remains give evidence about diet, agriculture, and food technology. A MUST SEE! Learning module from Caesarea Maritima, Israel highlighting archaeological methods relating to seeds and other botanical remains discovered through fine sieving of excavated dirt. Click on the various artifact symbols shown to see what the excavation unearthed. With grateful thanks to all who contributed to this project, to the Museum of Antiquities in Newcastle for the use of their images, and to the British Museum whose generous help to educators is invaluable.